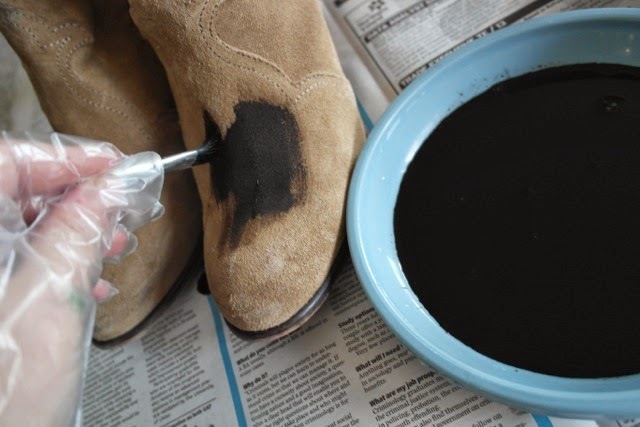 I've made the most of a quiet day today doing something I've been meaning to do for a few weeks now - dye my Office Namesake boots. Why on earth, I hear you say? Well, they are a light beige colour and they had an encounter with a leaking fat green marker - GRRRRR. 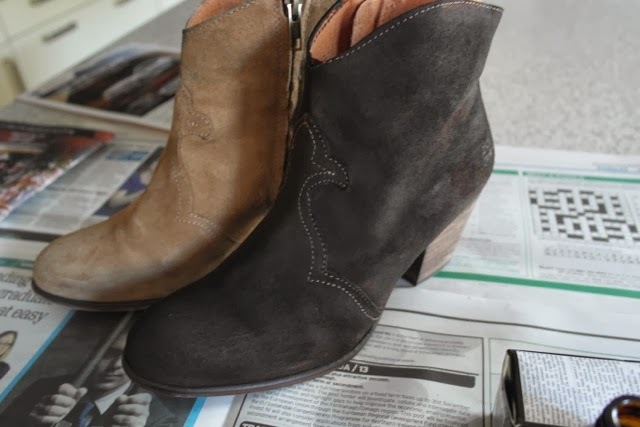 Co-incidentally, I had been on the look out for a dark brown ankle boot for a while so decided to dye these boots, seeing as they were pretty much un-wearable with their green smudges. Here we are with one complete and one to do. I love how the dye hasn't taken to the stitching so you can still see the detail on the front of the boot. 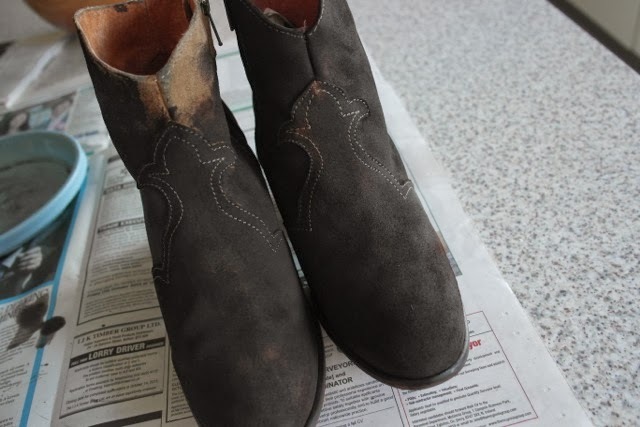 However, after finishing one, I could tell there wouldn't be enough dye for the second boot. Bummer. Second bottle ordered. So that's my handy tip - if doing boots - get two bottles! It's also a good idea when making such a big colour change as you'll always need to go over some areas again to ensure you've good enough coverage. I'll share them on here when they're all done and dried. But hopefully I've inspired you to give it a try if you've a pair of coloured boots or shoes you don't wear as much as you should. It's so easy and not too messy. Oooh fantastic! I loved them before love them more so now and so much more practical in this colour! 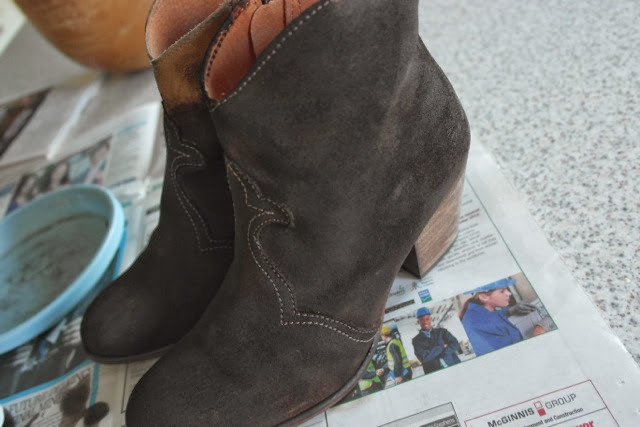 They look fabulous - gorgeous boots - love the idea of dyeing them! I was reading about pewter leather paint the other day too which looked fab. It will be like having a new psi of boots when your done. Ideal for the winter months too. Looks like you have done a superb dye job on these Avril! It's so satisfying to be able to up-cycle something isn't it! OMG - I'd be so freaked if I ran out half way through? What if the next batch of dye doesn't match perfectly? Will it be like when you're decorating and you need to find serial numbers on tins of paint to make sure they all come from the same batch? Eeek. Yay, thanks for this post. I have a pair of cream knee high suede boots that I have never worn and I have been debating whether to sell or dye them. Getting them dyed professionally was going to cost more than the boots did in the first place so I am glad that you had success dyeing your own. Did the suede stay nice and soft when the dye dryed, or did it go a bit hard? What a great idea! 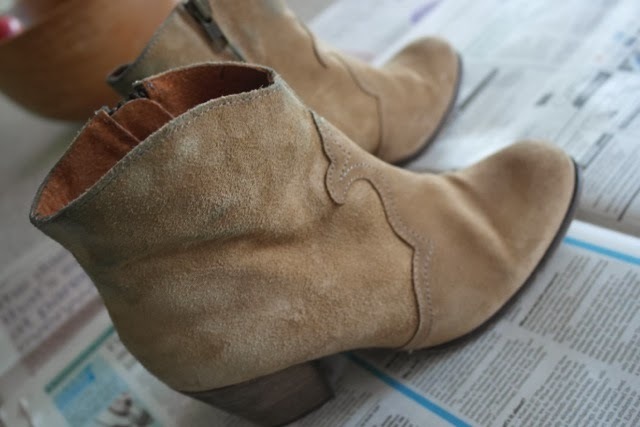 I have spilt a drop of oil on my new-ish taupe suede Jones the Bootmaker boots, which I'm gutted about as they just look really skanky. I love the colour they are but may try this if I can't find a way to remove the stain.